With weather conditions unlike any elsewhere in Canada, Vancouver has fewer extreme temperatures than those experienced by the majority of the country. Summers are usually pleasant, with sea breezes and clear skies and highs of around 22°C throughout July and August. While it’s still warm in September, infrequent but heavy rains showers can start. Both the spring and autumn months (end of September to mid November) are mild and wet, before temperatures dramatically drop towards the end of November, with averages dropping to around 9°C. Winter is cold and wet, with average lows around freezing. 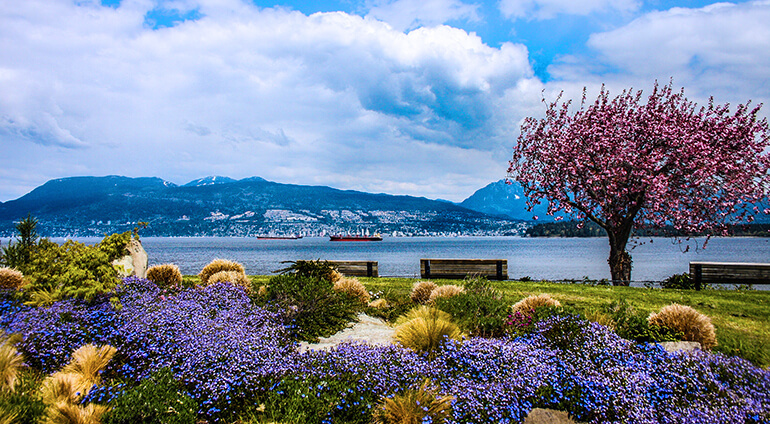 While Canada is known for its long, white winters, Vancouver’s coastal location means only a sprinkling is usually seen at sea levels, despite cold snaps often bringing heavy rainfall. The winter months see more rain than snow, with December and January seeing over 200mm of rain on twenty days in each month. However, mountain areas such as Grouse Mountain can usually expect good snow cover.